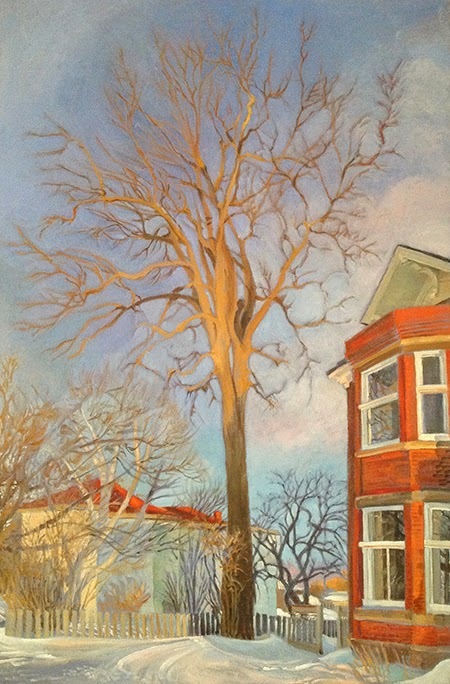 I have just finished the biggest oil painting I have ever done - a commissioned portrait of the largest Rock Elm on record, which lives in the nearby village of Merrickville. In order to capture the relationship of the towering tree and the old red brick mansion, I stood in the front yard and looked up. I took several photos, three of which would be joined for the composite view which I used as reference in the studio. I then sat nearby, writing a journal account of the time and place until dusk. 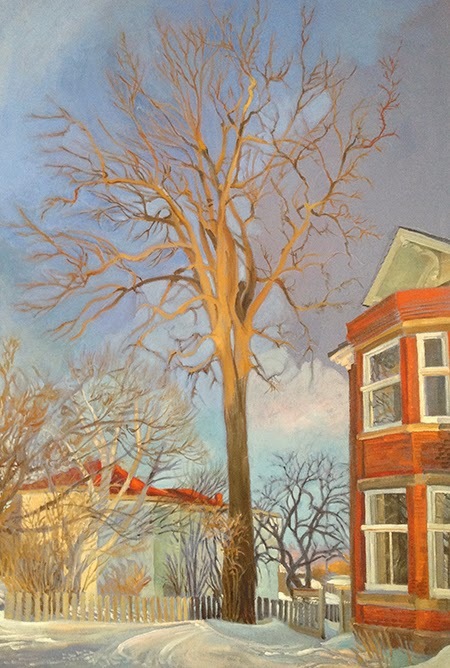 You can read my journal notes at http://www.aletakarstad.com, after the piece that Owen Clarkin (who commissioned the painting) wrote for me on Rock Elms. Rock Elms are characterized by thick corky wings of bark on the twigs. The main trunks of the Merrickville tree fork with proper acute angles at regular intervals, setting the dominant rhythm of the tree in an elegant, symmetrical shape - but within the shape of this tree, medium sized branches elbow dramatically at all angles, expressing their individuality, like surprise passages in a symphony by Beethoven. I began with a violet-gray underpainting on the 36 x 24 inch stretched canvas, and scratched the lines of tree and house into the wet paint. 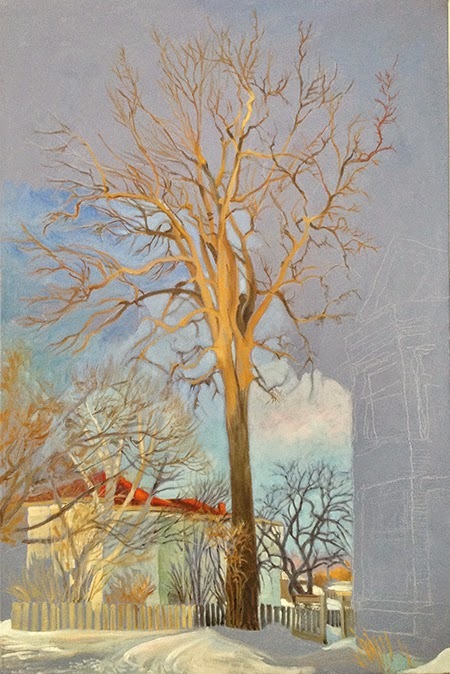 The tree trunk and main branches were painted onto the fresh underpainting, and next, quickly, came the neighbouring house and fence with trees and bushes, softly blending against the lower sky. I use water mixable oil paint, which dries a little faster than regular oils. I like to add new colours directly into fresh paint, "al fresco" for a soft, integrated look. If I work onto dried paint, the edges tend to be harder, and often require further strokes of the underlying colour to soften them. You can see the steps as I developed the painting. 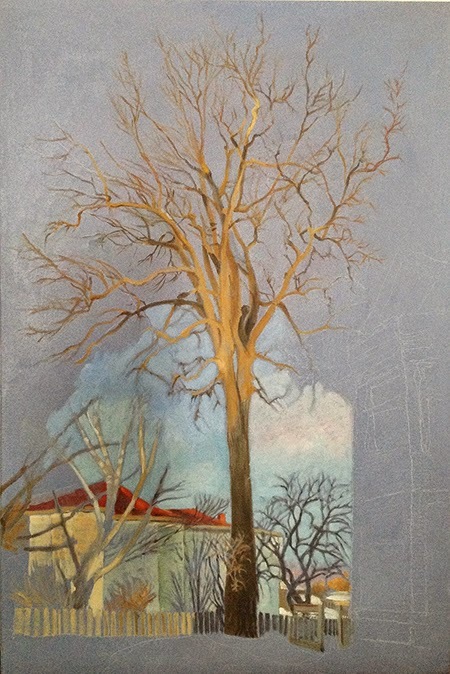 Since it was large, I painted the sky in sections with the smaller twigs against it, so that the paint of the sky would still be wet for blending the twigs into - especially the most distant twigs. In the larger image of the finished painting you can see the pale wispiness I painted on the sky between and among the twigs, This was a solution to the problem of how to get the crown to look full of twigs without painting every tiny twig of the many thousands (that would have reduced the brightness and made it look cluttered and fussy). The halo of ghosty twig impressions whiskered into the sky spaces in paler blue was a successful experiment - it filled out the back of the crown to look more three-dimensional! I exaggerated the orange of sunlight on some of the twigs of the crown, in order to make a bit more colour contrast up there against the sky. When I do this sort of thing Fred and I call it "red worms" - a trick which we first noticed in the 1970s in a painting of a rushing whitewater river. I am careful to keep my trick at a minimum, so that it does not alter the perceived colour of the subject, but only increases the effect of liveliness and immediacy. Red and orange appear nearer to the viewer, and where the opposite colours of blue and orange lie against each other, they actually vibrate in our visual perception. Bark texture was important to show, but not everywhere - because when you look at a tree, you don't look at all of the detail at one time. This is hard to explain, but it's part of what makes an oil painting different than a photograph. The painting flows from lights to darks and guides your eye like music on the canvas, understating some things and overstating others to produce the effect of actually being in the presence of the tree. At first I was worried that the building would compete too strongly with the tree, or that my angle on it would look strange and distracting, but the towering Rock Elm holds its own in its relationship with the house. It was fun finding reflections in the windows and changing the colours of paint on mulleins and frames according to sun and shadow. I don't paint many buildings, but I always enjoy it! 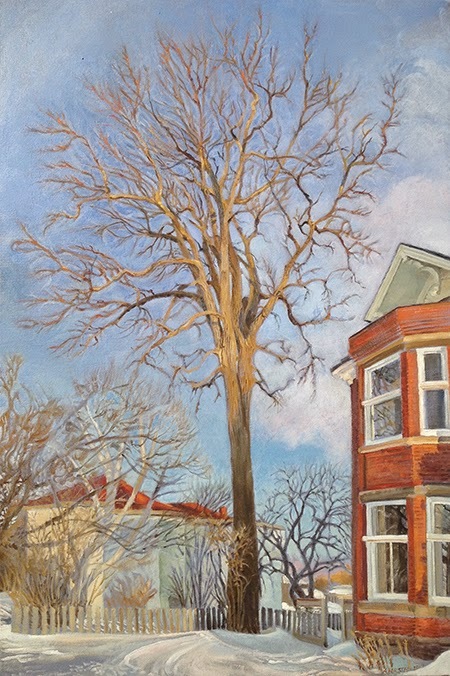 The mansion, built in the late 1800's, adds a sense of "Heritage" to the painting for those who may not already be aware that this Rock Elm, being of a slow growing species, is certainly older than the building, perhaps even twice its age! Owen has a photo of the mansion taken in the 1920's, which shows that its companion tree was almost as large nearly 100 years ago as it is today! 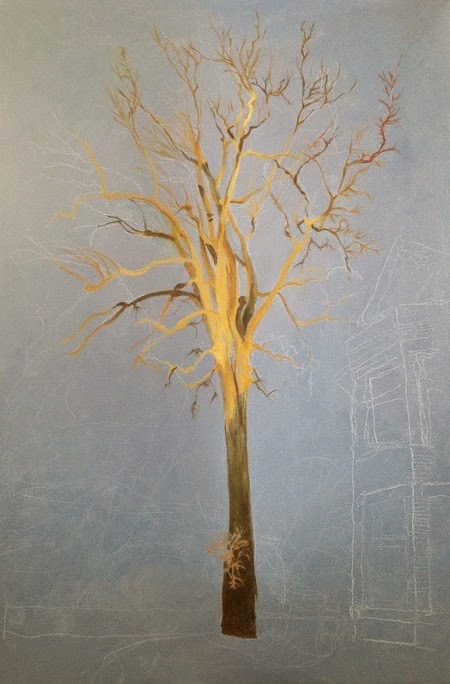 This painting is the first of a series of Elm tree portraits commissioned by Owen, to raise public awareness of notable trees in eastern Ontario. 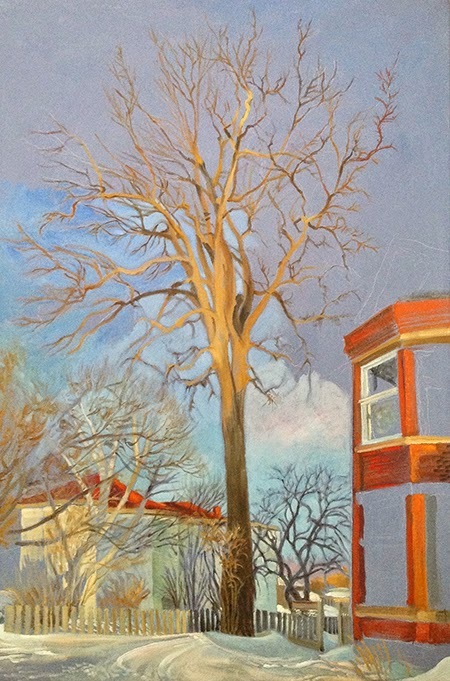 Next will be a large and graceful Slippery Elm by the Ottawa River west of Aylmer, Quebec, and the third will be a huge American Elm in downtown Aylmer. He is also writing a book on the subject.